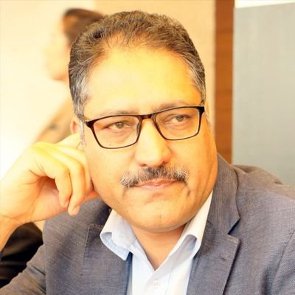 Shujaat Bukhari was a human rights defender working for justice and peace in Kashmir Valley in the state of Jammu & Kashmir in India. He was a prominent journalist and editor-in-chief of the english language daily newspaper Rising Kashmir. Shujaat Bukhri was instrumental in organising peace conferences in Kashmir and was part of secondary diplomacy initiatives between India and Pakistan. He advocated for a revival of the Kashmiri language in educational and literary establishments in Kashmir.